The mystery of the bewitched house at Ferrestone Road, Hornsey, is to be investigated immediately by the Society for Psychical Research. A prominent member of the society has placed himself in communication with the distracted household, and his services have been gratefully accepted. The theory that the whole trouble is due to the powers of Gordon Parker, the twelve-year-old nephew of Mr. Frost, the householder, received a rude shock yesterday. There was fresh trouble early in the day, when the boy Gordon was not in the house. According to Mr. Frost, the disturbance was renewed at 7 a.m. A pin cushion and other articles were flung from the chest of drawers to the floor. An orange lifted itself off a chair and dropped on the children's bed. A gown was overturned on a chair. The children, Frost insists, could not have touched any of these things. Members of Mr. Frost's household have been cross-examined and re-examined during the last few days by numberless inquirers. They quite admit that their story seems fantastic beyond belief; but they ask the sceptics what motive they could have for concocting such a tale and for breaking up their own home. As anyone who visits the house can see, the manifestations, whether spiritualistic or not, have done material damage. Windows and pictures and crockery are broken, and the walls are scarred where pieces of coal have struck the wall paper. A woman neighbour who called to express sympathy states that a piece of coal, thrown from apparently nowhere, struck her on the leg. Mr. Frost has suffered in health so much that his employer went home with him yesterday to make inquiries himself. "We sent the boy out of the room while we talked, and hardly had he turned the handle then there was a crash in the kitchen at the back. I ran out," said Mr. Millard to a press representative, and saw that some trays had fallen down and the boy was crouching frightened in a corner of the kitchen." What is the secret of the strange things that are said to happen almost daily in an eight-roomed villa in a quiet road in North London? The occupants say weird occurrences are taking place. Loud explosions have been heard, lumps of coal fly in all directions, plates rattle, and tables and chairs go jazzing about the room. This has been the state of affairs for the past three weeks, and a curious feature of the trouble is that nothing unusual takes place while a twelve-year-old schoolboy, the grandson of Mr. J. S. Frost, is away from the house. The Rev. A. L. Gardiner, of St. Gabriel's, Bounds Green, Hornsey, and the Rev. A. Chandler, vicar of St. John's, Wood Green, have interested themselves in the matter, and Mr. Chandler took the boy on Tuesday to sleep at his residence. Arrangements are being made by the clergymen and some friends to send the boy away to the seaside. "I know nothing whatever of spiritualism, but my idea is that the boy is a 'medium.' His mother died in the house about a year ago and must, I imagine, be trying to communicate something to the family. "On Monday the boy, with one of his brothers, was put to bed. 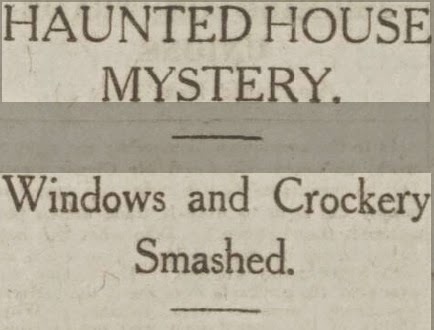 I was in the house at the time, and a few minutes later we heard screams in the bedroom. We rushed up, and both the boys declared they had seen their mother, 'dressed in red,' at the foot of the bed. "They also said that the bed had been lifted off the floor, and while I was the room several articles were dropped or thrown about from no-one knew where." The boy was examined Wednesday afternoon by the family's medical adviser, who declared that he was in perfect health. "I believe it is the spirit of my sister," said Mr. Frost, the tenant of the 'haunted' house at Hornsey, when discussing the strange events at his home with a Press representative on Friday. "She is trying, I think, to get into communication with us," he added. "She tried to tell us something before she died, but passed away before she could make us understand." Mr. Frost said the disturbances had continued all night at intervals. "Manifestations" similar to those previously reported took place, and articles fell about and were smashed. Gordon, the little boy who was thought to be responsible, is still away from the place under clerical care. Occultists, church officials, and many other people have visited the house, and on Friday night Professor M. Gunnell, of the Psychical Society, began an investigation on condition that complete privacy was maintained. 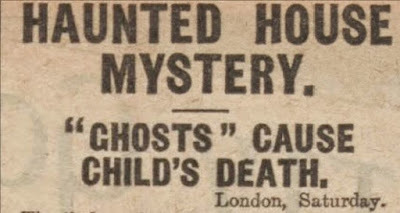 The "ghosts" in Hornsey's haunted house have, it is declared, brought about the death of Muriel Parker, the five-year-old niece of Mr. Frost. "There is not the slightest doubt that Muriel's death was caused by the strange happenings in the house," said Mr. Frost in an interview. "When my two boys, Gordon and Bertie, returned to the house about a fortnight ago, the manifestations started again. Chairs were thrown about, and pieces of coal hurled against the walls. These occurrences were too much for Muriel's nerves, and she broke down. She was ill for nine days, and died yesterday. The doctor reported meningitis as the cause, but said that nerve strain had accelerated death. "Sceptical people have laughed at the 'ghost stories,' and have said that we have caused all the happenings ourselves. Perhaps the death of my little niece will convince them that we are not responsible. As a matter of fact, we are having a terrible time. We are forced to keep the two boys out of the house as much as possible; our home is being ruined, and we are all becoming physical wrecks. "There is only one course open to us now—to more into a new house. "We do not want any sympathy. It is too late now. All we hope is that people will think a little in the future before they poke fun at things which are beyond their understanding." Muriel, it stated, took no notice of the happenings for some time, but one day a chair fell over near her, and she bit her tongue. She afterwards showed signs of extreme nervousness.